With FilterPoint web part you can quickly and easily dig into the data displayed in SharePoint lists, libraries and web parts - easily finding the data, and data sets you need. Simple Setup - in seconds. Wide choice of filter styles including: Radio Buttons, Drop Downs, Checkboxes, Free Text, Date Picker and People Picker. Send filters to multiple lists and Web Parts. Works with List View and 3rd party Web Parts, separately or together. 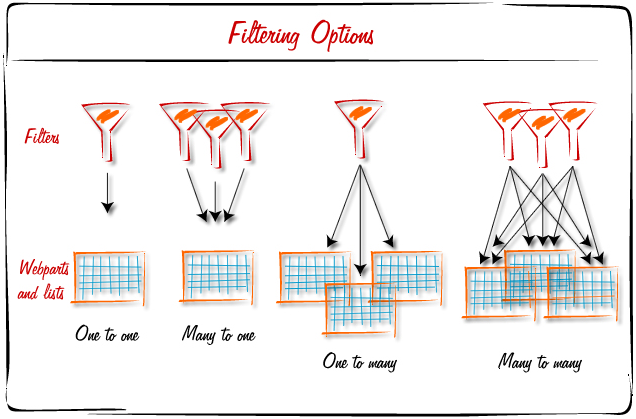 Set up multiple Filters from one FilterPoint Web Part. Set Default values like [Me] or [Today]. Clear filters with one click. Quickly guide your users to the data that's most relevant to them. In this example FilterPoint is applied to a helpdesk issues list, so that, by default, the dispatcher sees unassigned, high priority tickets, but still has the option to flick to other data sets at the click of a mouse. 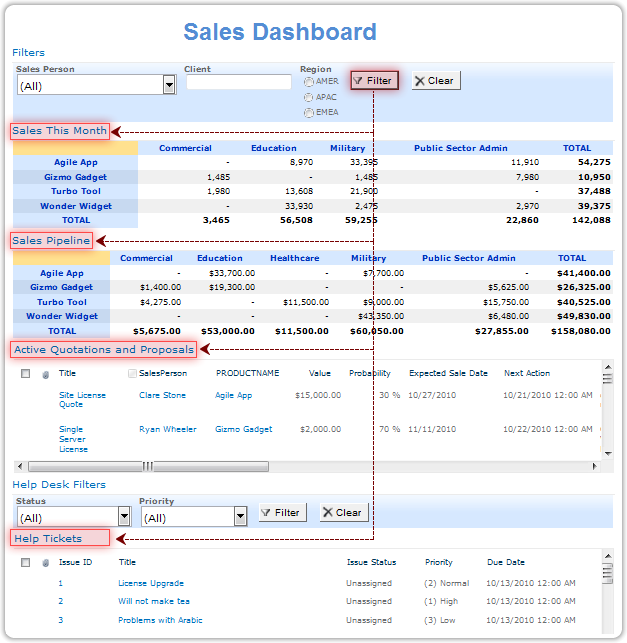 Use FilterPoint with a combination of lists and web parts to create an Invoice Management Dashboard. In this example, FilterPoint has been added to a page containing a SharePoint list of Current Invoices and a PivotPoint web part applied to that list. Viewing the dashboard, a credit controller or finance manager can quickly see underlying trends of paid and unpaid invoices by time period, client sales rep or region through PivotPoint. Then dig into the detail of relevant items, taking action where needed, via the list. Go a step further and use FilterPoint to create dynamic dashboards - bringing together relevant information from a number of lists and libraries, all in one place. In this example sales staff and managers get 360 view of client activity with a dashboard containing list views and Web Parts drawing data from 3 different lists, showing Sales this Month, Sales Pipeline, Open Quotes and Helpdesk tickets, all filterable by Sales Person, Company and Region.